For the vast majority of practitioners histamine is only relevant when considering immune responses to environmental insults especially during certain seasons. However, its functions in the body are both numerous and far reaching as it is also a neurotransmitter. Histamine is released in the body upon mast cell degranulation and may be received by one of four receptors (H1R-H4R). Of these receptors we primarily understand the H1R (found throughout the body in smooth muscle, vascular endothelial cells, heart, and central nervous system) and the H2R (triggers gastric secretion of histamine to regulate HCL production). Pharmacologically, H1 antagonists are antihistamines. H2 blockers are medications traditionally prescribed for those with acid reflux. 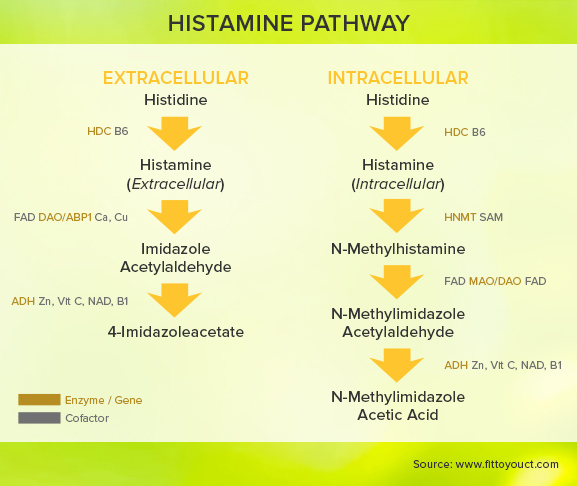 The extracellular histamine pathway is used to degrade histamine in the gut whereas the intracellular histamine pathway degrades histamine in the rest of the body. Regardless of pathway, the enzyme DAO (requiring the riboflavin derived cofactor FAD is required. SNPs to DAO therefore reduce histamine tolerance. SNPs to other enzymes in the pathway or insufficiency of required cofactors may also influence histamine breakdown. Jessica Pizano is the owner of Fit to You, LLC, which offers clinical nutrition and nutrigenomic counseling, as well as personalized training programs. She earned a master's degree in human nutrition that emphasizes functional medicine at the University of Bridgeport and is a certified nutrition specialist (CNS) through the Board for Certification of Nutrition Specialists. She is pursuing a doctor of clinical nutrition at Maryland University of Integrative Health where she also teaches a graduate level course on nutritional genomics. A certified personal trainer and a corrective exercise specialist through the National Academy of Sports Medicine, she is also certified in mat Pilates through PHI Pilates and earned her Clinical Exercise Specialist and Longevity Wellness Specialist through the American Council on Exercise. Currently, Jessica practices nutrition counseling, nutrigenomics, and personal training in her studio in Avon, Conn.
Kohn, J. (2014). Is There a Diet for Histamine Intolerance? J Acad Nutr Diet, 1860. Moulderings, G. B. (2011). Mast cell activation disease a concise practical guide for diagnostic workup and therapeutic options. Journal of Hematology & Oncology, 10.